Ever since the invention of computers, software has been all about automation and more efficient execution of manual tasks. Today, software itself is becoming more and more complex. There is a growing need for automation in the area of software development, particularly software quality. Yonita is the answer to this need! 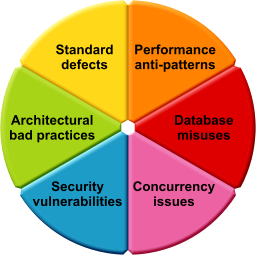 Yonita is a solution for automated detection of code defects early in a development lifecycle. Yonita Web Scanner provides extensive automated black-box testing of web applications in search of security vulnerabilities! Our vision is to change the way software houses, developers, and end-customers find bugs and vulnerabilities in their software. Thanks to detection of bugs and issues during the coding phase, we are able to cut development costs and reduce schedules as well as improve quality of software. To detect defects in software, Yonita combines static and dynamic application testing. Static application testing is performed using a cutting-edge static analysis implemented in Yonita Code Scanner, whereas dynamic application testing is executed using Yonita Web Scanner.